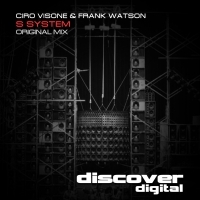 Frank Watson and Ciro Visone collaborate for the first time on Discover to phenomenal effect. S System is kicks straight in with power and intent delivering acid and vox stabs and FX to give the intro its full power. Once the break arrives its all about the riff which is infectious and delightfully understated. Proper trance that kicks like a mule. Just how we like it!! 'S System' is available now from Beatport and iTunes.